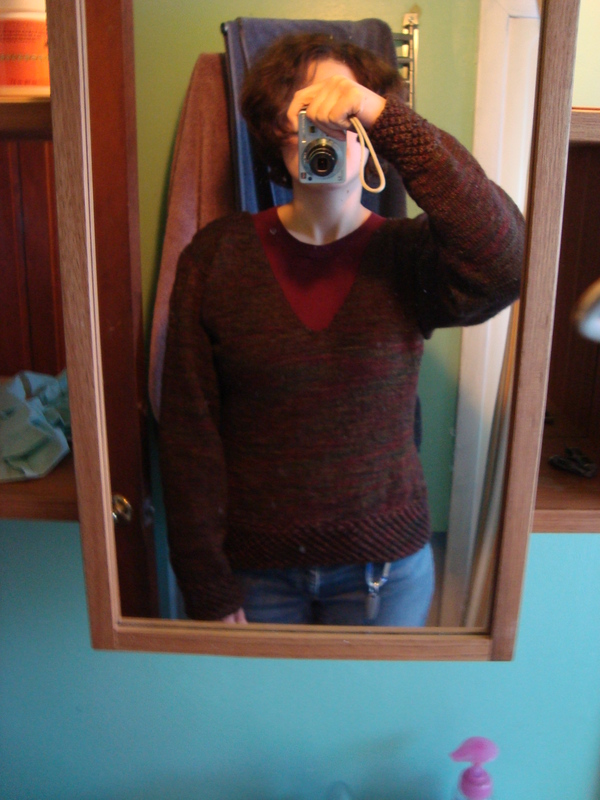 That would be a sweater that now has two cuffs and two attached sleeves! This unlikely burst of almost-finishing was brought on by a very strict rule that there would be no winding of silk and tencel until the sweater was put together. Amazing how one little rule can completely change the game, isn’t it? With that one little decision, our underdog has pulled out ahead after all. And now, I think I am off to wind some very soft yarn before heading out to spinning guild for the rest of the evening. We wouldn’t want too much discipline, now would we? Looking good! Sometimes it’s good to impose a little discipline in our lives. I spent most of yesterday on the tasks I didn’t really want to do this week, knowing that it would just be better to get them out of the way. Now I just need to reward it with some knitting! Good luck with finishing the sweater, but enjoy petting the silk/tencel. It looks like a sweater to me! Although it’s hard for me to look at a sweater right now, it’s so warm here! DesigKnit is powered by	WordPress 4.8.9 . Page generated in 0.290 seconds using 34 queries.